Univ is delighted to report an important new gift to its archives. 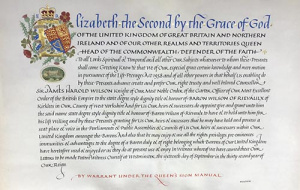 The family of Harold Wilson, UK Prime Minister in 1964-70 and 1974-6, but also Junior Research Fellow and Fellow of Univ from 1938-45, have generously presented to the College the proclamation from 1983 making him a life peer and conferring on him the title Baron Wilson of Rievaulx. This is a wonderful memento of one of Univ’s most distinguished members. 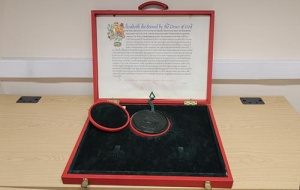 One intriguing aspect of this document is several aspects of it, such as the use of the Great Seal, its being written on parchment, and some of the language, matches very closely royal documents in our archives dating from many centuries ago.